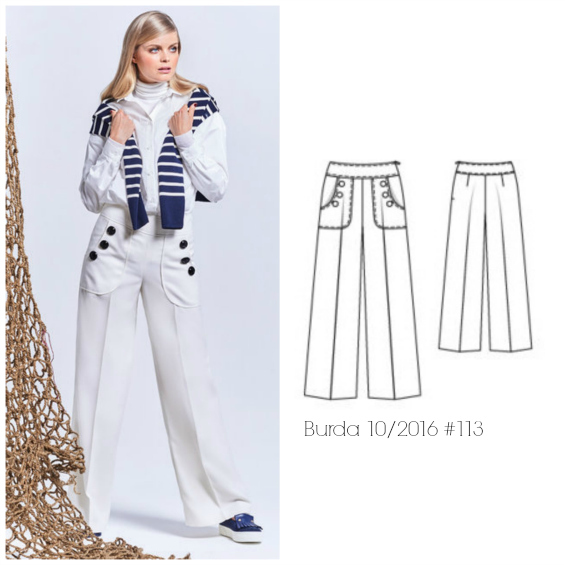 lower your presser foot: Burda of the Month: 10/2016 #113 W I D E leg pants! 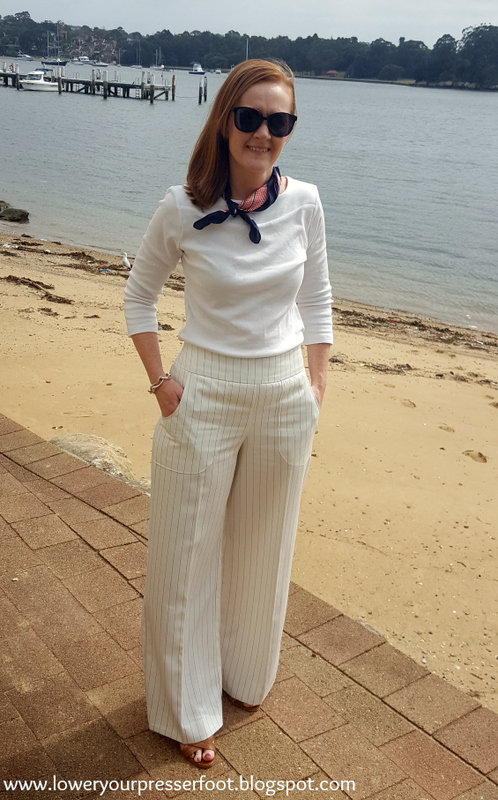 Burda of the Month: 10/2016 #113 W I D E leg pants! So I may have finished my October Burda of the month project in mid November, however since my November issue hasn't yet arrived I am technically up to date in my Burda challenge - yay for me! These pants legs are super wide, and it feels quite strange to have fabric swishing around when I walk after so many years of wearing skinny leg jeans and pants. 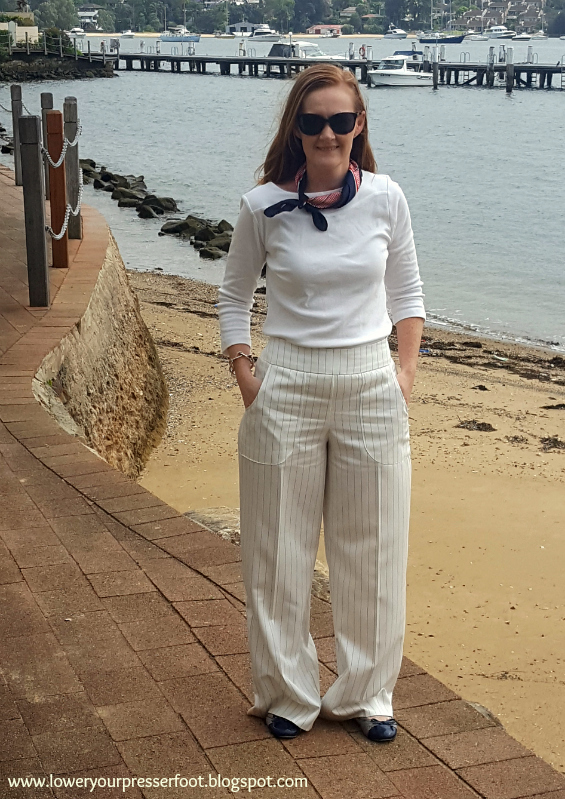 And I'm still not sure where I will wear these pants - even if fashion magazines are declaring the death of skinny legs, no-one in my neighbourhood is getting around in flares or palazzo pants yet. I wasn't sure if I'd like this pattern and I was just hoping these would turn out to be a wearable muslin (ie the cross your fingers and hope you make something half decent approach!). 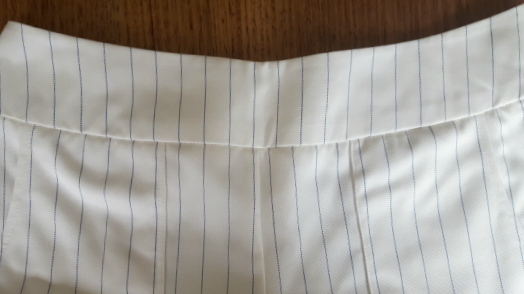 I've had this fabric in the stash for a long time - it's just a poly/cotton mix which came from an op shop and I have lots of it so there was nothing to lose, but it has the perfect weight and drape. It does however wrinkle terribly - those creases at the front aren't whiskers due to tight fit but rather wrinkles for sitting down for the 3 minute car drive to get to the waterfront! So overall I'm a bit on the fence about this project. On the one hand, I think they look pretty good in these photos (apart from those wrinkles) and it was a very easy pattern to make. 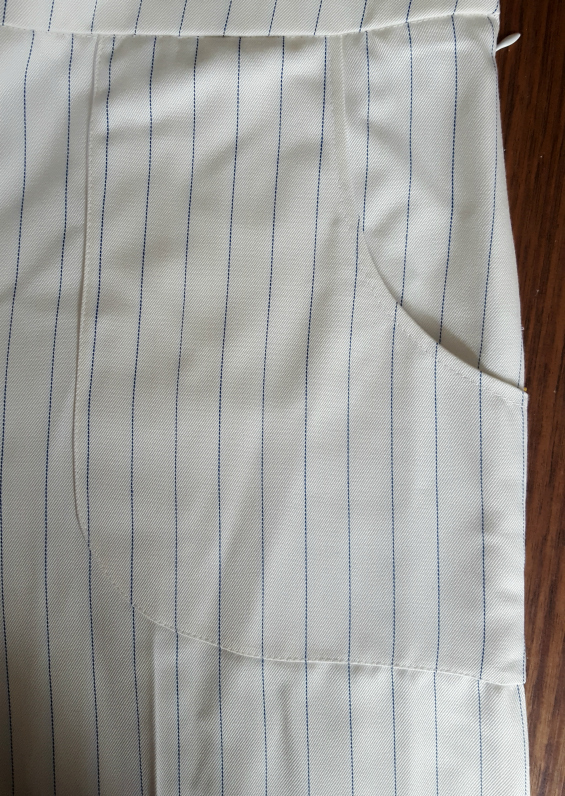 However I'm not sure how practical they are in real life - what to wear with white and blue pinstripe pants? 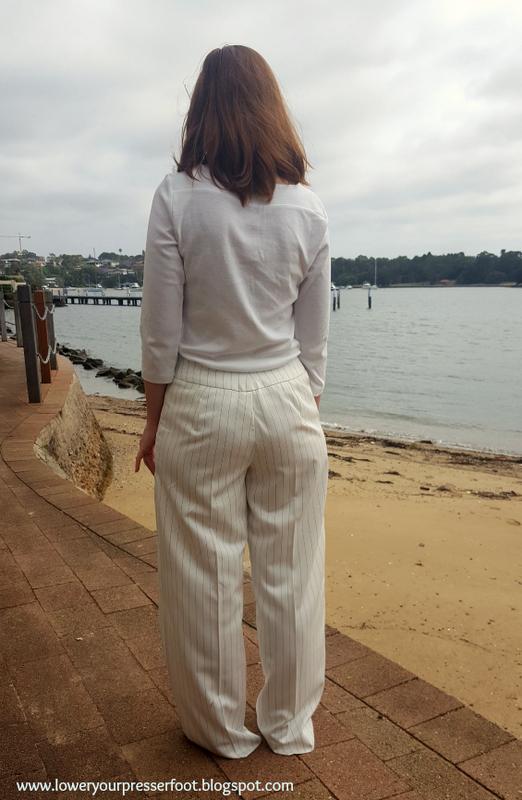 Where to wear such swishy, wide leg pants? And how to keep them clean? 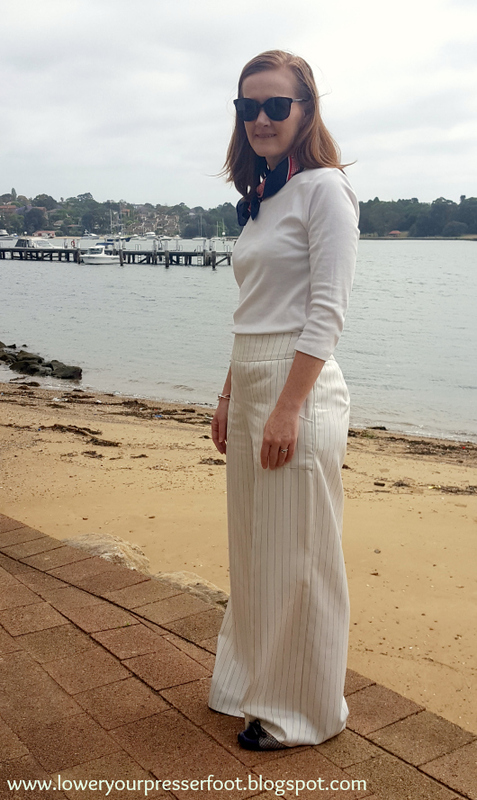 Just wearing them for these photos resulted in the hem getting so dirty I had to change out of them straight away. 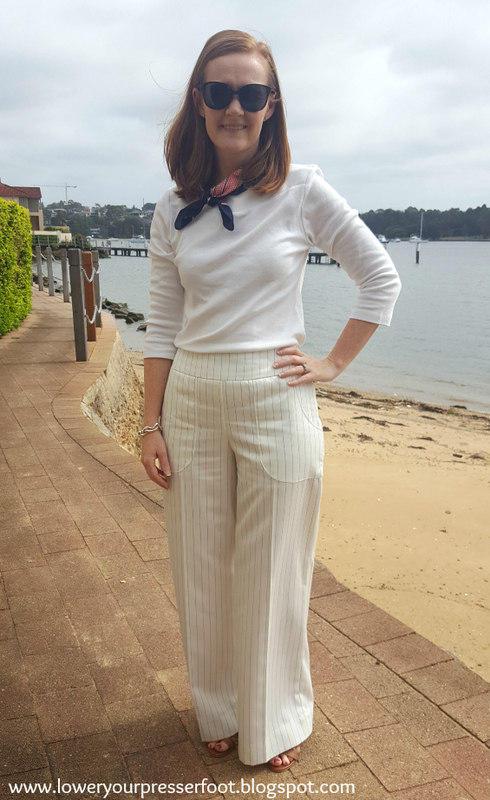 This is one of the few times I've worn something just for the sake of taking blog photos - I feel like a bit of a fraud to tell you the truth! 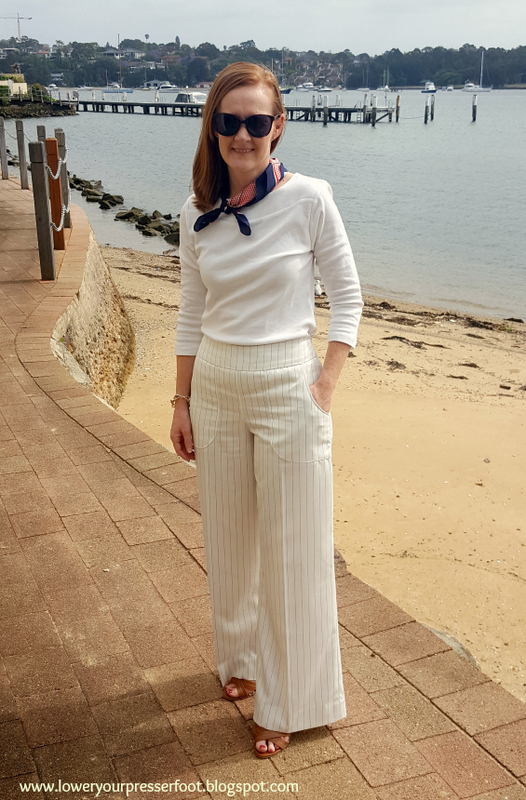 Anyway, if wide leg pants are your thing I can thoroughly recommend this pattern to you, I think they would look quite dramatic in silky black material paired with a sparkly top for evening wear, but overall this is a lot of look for a daytime for quiet ol' me!